What your getting: Bag of 3 Height: 12-24" tall Bloom Time: Foliage plant all season Bulb Spacing: 4 bulbs per sq. ft. USDA Hardiness Zones: 2, 3, 4, 5, 6, 7, 8, 9, 10. 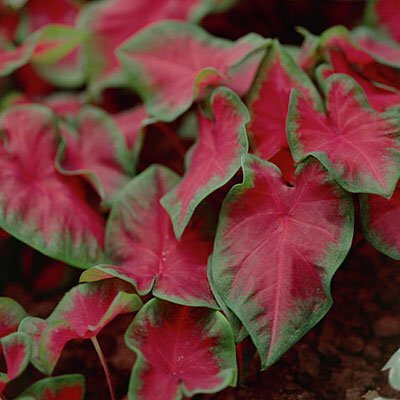 Caladium Bulbs Frieda Hemple: Add bold color to the summer garden with the Caladium Frieda Hemple. The large, dark-red centers are offset by green borders. This variety thrives in both sun and shade and is perfect for hanging baskets or containers.